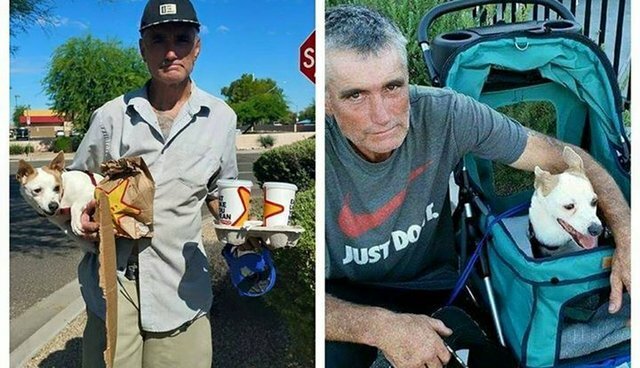 Roger the dog and his human don't have a permanent place to live, so they spend their days out on the streets of Glendale, Arizona. The pavement can get dangerously hot in the summer, so Roger's dad sets aside any concern for himself and holds Roger in his arms all day, carrying him around just to keep his paws from getting hurt on the hot sidewalks. Lisa Peterson walked by the two of them together and was struck by the love they shared - and by the heartbreaking image of a man without a home, carrying his dog in his arms all day just to keep him safe. So she decided to help. Lisa reached out to rescue group Helping Hands For Homeless Hounds, and when their volunteers met Roger and his dad, they knew they could help. Lisa wrote on her Facebook page that their volunteers "hooked him up with food, water, snacks, goodies and of course ... a stroller. AND - he said YES to neutering his dog Roger." While it may not be a permanent solution for Roger and his dad, having some snacks in his belly and a comfy place to sit all day will make things easier for Roger - and for the man who clearly loves him. Most importantly, the two now have a community of dog lovers to help them out and keep an eye on them. To find out how you can help, visit the Helping Hands For Homeless Hounds website.